The economic success of your business depends on many factors. A crucial one is collaboration with a bank you can fully trust at all times. 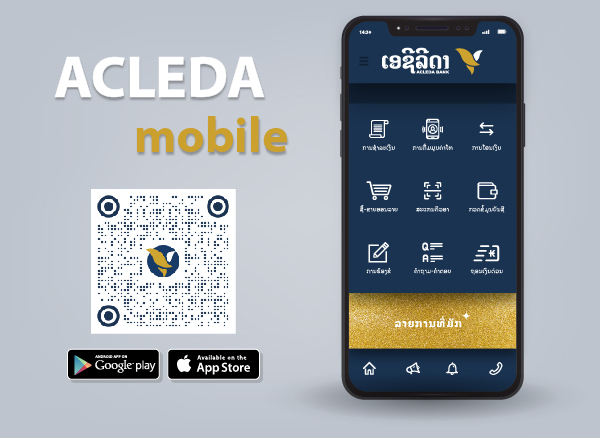 ACLEDA Bank Lao Ltd. can assist your business throughout our largest branch network in Lao with world class information technology. Our aim is to support you in all financial areas with comprehensive solutions tailored to your company's individual needs. An import bill received by ACLEDA Bank from a bank of seller enclosing drafts, invoices, bills of lading, etc., requesting ACLEDA Bank to present documents to the buyers for either payment or acceptance. The seller obtains the usual transport documents such as bills of lading, insurance certificates, commercial invoice, inspection certificates, etc., to request to ACLEDA Bank to forward to the bank of buyer. Documentary Credit is a unilateral contract that is issued by ACLEDA Bank Lao Ltd. referring to the request's importer (buyer) to ensure the price's goods settlement to the exporter (seller) accurately if he/she can perform the conditional contract in Documentary Credit, and this ensuring is made through the bank of buyer or seller. Documentary Credit (Import) is a type of services that ACLEDA Bank Lao Ltd. issues document on behalf of the buyer to guarantee the seller for accuracy payment to the seller if he performs the condition of contract in Documentary Credit. Documentary Credit (Export) is another type of services that ACLEDA Bank Lao Ltd. advices, confirms, or negotiates on Documentary Credit (L/C) issued by the buyer's bank. In this case, ACLEDA Bank Lao Ltd. has roles to check the authenticity of Documentary Credit by referring to the sale contract. To do a large-scale business-transaction or implement very expensive project, you are required to have a Bank Guarantee. Depending on different purposes and needs, ACLEDA Bank has established various types of Bank Guarantee of which you can use to fulfil the requirements. Shipping Guarantee is a letter that is issued by ACLEDA Bank Lao Ltd on behalf of the importer (buyer) to assure the shipping company for damaging, losing, or risking of goods released without documents to the importer. The requirement of this service happens, when goods is in destination before original documents arrival. Retention Money Guarantee is a type of letter that is issued by ACLEDA Bank Lao Ltd for settling to beneficiary for an agreement to give retention money to the requestor, and if he/she did not perform an agreement or contract accurately, the beneficiary can settle from the bank. Note: In order to use our Trade Finance Service, customers are required to have an account with ACLEDA Bank Lao Ltd. Please contact our officer on how to open an account with our bank if you don't have any.